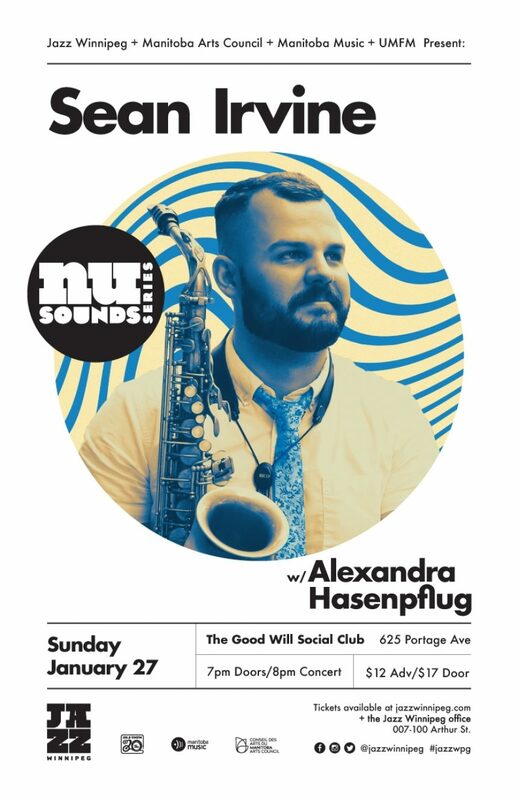 Jazz Win­nipeg con­tin­ues to push musi­cal bound­aries with their NU Sounds seriesat the Good Will Social Club on Sun­day Jan­u­ary 27th with a col­lab­o­ra­tive, immer­sive artis­tic expe­ri­ence inspired by music from around the world fea­tur­ing Wood­wind Spe­cial­ist Sean Irvine and Synes­the­sia Artist Alexan­dra Hasenpflug. Accom­pa­nied by Andrew Lit­tle­ford on trum­pet, Will Bon­ness on piano, John Baron on bass, and Kevin Waters on drums, band leader Sean Irvine will take con­cert goers around the world; reimag­in­ing their tra­di­tion­al folk songs with­in the lin­guis­tics of the Jazz dialect. Alexan­dra Hasenpflug will be paint­ing through­out the con­cert, bring­ing image and colour to the sound of music, and we will be fea­tur­ing a col­lec­tion of her orig­i­nal works avail­able for pur­chase. Proud­ly pre­sent­ed in part­ner­ship with Jazz Win­nipeg, Man­i­to­ba Music, the Man­i­to­ba Arts Coun­cil and and UMFM 101.5.